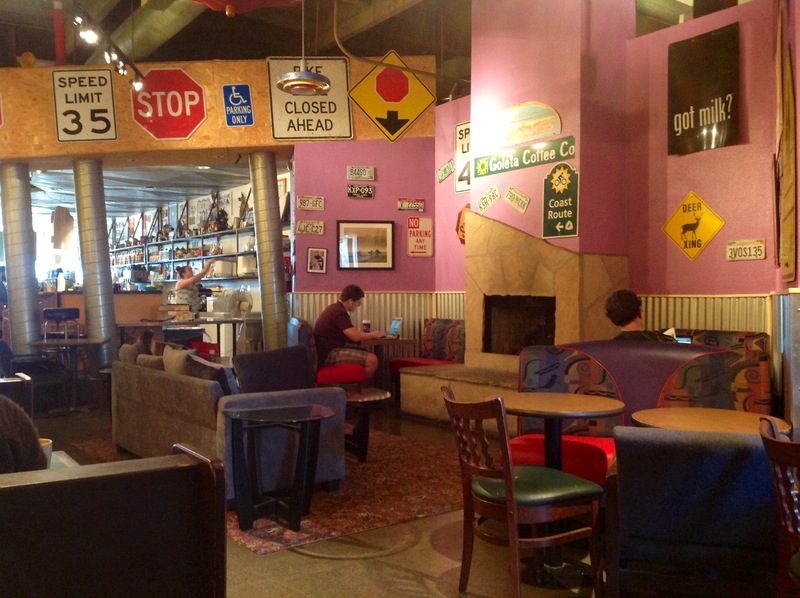 After the reinvention of Red’s coffee shop in Santa Barbara’s funk zone, Goleta Coffee Company has been my favorite coffee shop. I don’t come too often, because there are so many more that are closer to where I live. But I really just love this place, feel instantly at ease, cozy, and energized by all the visual eccentricities. I adore places like this. A little industrial, a little mismatched and haphazard, and if you can’t have an outdoor patio, then yes please to the fireplace surrounded by booths and a couch. Some of the furniture is quite hideous, and there’s a crazy red paisley rug on the concrete floor under the sofa, but these things make me want to camp out for hours all the same. I’m really here to do some IIN coursework, which I’m excited to get started (who ever predicted I would say that about school! ), but I was listening to one of Jen Lee’s Retrospective podcasts, (where she has conversations with so many different people with different backgrounds and different kinds of work about how they got where they are, stories from their life and what drives, inspires and provokes thought in them.) on the way over here. She interviewed a novelist, Diana Spechler in the one I listened to this morning, and I was so captivated by this conversation. It just sparked so many thoughts in me.. Those kinds of mind-boggling, open-ended, questioning thoughts about why the society is in the state and shape that it is, and how achingly delicate and impressionable the human mind can be, and how long we can hold on to healable wounds that we try not to realize are there. It made me think about how so many people are in such desperate need for connection, whether they realize it or not. And how overwhelming that need seems sometimes, and by that I mean the need in the world. How great the need is for mentors. The need for, not even service and resources and organizing committees, but for one individual to sit with another individual and be able to hold a space of patience and honesty and unconditional love. For a conversation. I guess, for me anyways, it always comes back to conversation. So much can be healed through conversation with another. Through entering into a real conversation with yourself about how you’re making your home in the world and what is or isn’t nourishing you. A conversation with the scarier parts of the secret wishes and judgments that we try to keep locked inside ourselves so that the world stays properly balanced on our own self determined axis. And I don’t think the power even lies in finding the answer. I think back to how many friends and former homeless shelter clients, and even fictional characters (which you know were based on real emotions) have said, if only I knew why I do this! Why do I have this pattern, this reflex, why do I keep myself here, why do I do this to myself… if I only knew why, maybe I could do something about it. It sounds almost like just another mind trick to keep yourself stationary, doesn’t it? Safe in the obvious truth that until you figure out the answer… there’s nothing that can possibly be done differently. I think fixating on the answer is a stalling technique. And I think the real power lies in the conversation. In the attempt to understand. In the willingness to hold a dialogue with yourself or someone else, or in prayer or in meditation, and to ask the difficult questions, “the questions that have no right to go away” (David Whyte). To always try to have that courageous conversation. It opens up those dark and messy places, it brings them into the light, little by little, until they don’t feel so taboo anymore. Until the twisted and aching, the hidden and seemingly shameful are finally recognized as passing, malleable, and so unavoidably human and common and cyclical. I don’t know how it happened, that unpleasant feelings became so unmentionable. Like excitement and enthusiasm and affection and satisfaction are the most acceptably universal feelings. But shame… loneliness, and despair and numbness and uncertainty and even sometimes desire… struggle… how did those feelings get exiled? To the land of no-that-never-happens-to-me or don’t-you-mention-that-out-loud-because-it-might-make-people-uncomfortable… to see or talk about an emotion that has a story attached to it. Its all just so stupidly common. From drug addictions, to body image and disordered eating, to the aftermath of feeling abandoned by a parent to the regular old longing for things to be shaken up a little. I may have ended up in a very different place than the podcast started me out with. But isn’t that just how thoughts are. They tip and they pour into other thoughts, which tumbled out in various directions and trip over personal histories and experiences before being sifted into new or rehashed notions. And I just had to get that all out onto a page, even a virtual one, so that I can focus on learning dietary theories and planning out my February. Thanks for having coffee with me.